How much does Obama girls' Bahamas spring break cost US taxpayers? America’s national debt is now fast approaching $17 TRILLION. Earlier this month, the White House even canceled public tours as a result of the recent budget sequester, citing Secret Service staffing costs. Despite that, the POS continues to spend precious taxpayer dollars, flagrantly and wastefully. 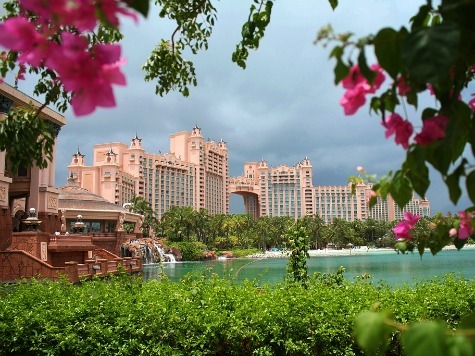 Three days ago, Breitbart.com got a tip that the Obama girls, Sasha and Malia, are quietly spending their spring break at the Atlantis resort (pic below) on Paradise Island in the Bahamas — information that was not publicly announced or reported. Secret Service spokesman Bryan Leary declined to answer when Breitbart News asked him for details on the cost of the trip and how many Secret Service agents or other resources are assigned to this trip, instead saying the agency would not confirm or deny trip details for anyone under its protection, including Sasha and Malia. It is unclear if First Lady of Snot Michelle Obama is also at the resort, or if she is planning to join her daughters there. According to the nonpartisan citizen watchdog group Judicial Watch, Malia Obama’s trip to Mexico last spring break, during which she was apparently accompanied by Secret Service protection, cost taxpayers $115,500.87. Sasha did not accompany Malia on that trip. Now Judicial Watch wants to know how much Malia and Sasha’s 2013 spring break in the Bahamas is costing taxpayers. Matthew Boyle reports for Breitbart.com, March 26, 2013, that Judicial Watch has filed a Freedom of Information Act (FOIA) request of the Obama administration for expense details on first daughters Sasha’s and Malia’s spring break vacation. The administration legally has 30 days to respond to Judicial Watch’s FOIA request, but the POS has broken that rule in the past. Judicial Watch filed its FOIA request for records on Malia’s Mexico trip in early April 2012, but the administration stalled on providing the documents until after the election. Judicial Watch ultimately filed a lawsuit to force the administration to release those documents. This entry was posted in Children, Economy, Liberals/Democrats/Left, Media, Michelle Obama, Obama, Taxes, Travel, United States, US Presidents and tagged Judicial Watch, Secret Service. Bookmark the permalink. I don’t blame the girls for taking advantage of their child hood dreams which is probably beyond their imagination. How nice they went to Atlantis. My grandkids got to go to work. This is the real world. These girls are getting to have the time of their lives on the taxpayers dollars. Why can’t the Obama’s pay for their children’s vacations themselves? They have already stolen enough from the taxpayers to support a small country, quite regally. Wonder where they will move to after his fiasco of a presidency. I can’t wait until they all leave the Whitehouse! I wonder if we paid for their friends as well? So much for leading by example. Thank you Dr. Eowyn for this post which sets forth the “let them eat cake” philosophy of the king and his realm. It is ever so clear that we have a king and a queen in office, who send their children wherever they want to go at the taxpayers’ expense. It doesn’t matter what horrible economic shape we are in! Making the “sequestration” as painful as possible, while treating the royal family to an endless succession of expensive pleasures, doesn’t sound like a good idea. We have become the two-tiered society I have been warning about for years. The ruling class (them) vs. the peon class (us). And not a republican in sight who has the stones to even condemn it. And from Spring in the Bahamas to where was it? Aspen? Vale? All those rich towns start looking the same after a while … and the food … but the skiing is great … and they got to bring their friends I am sure! I’m lucky if I have time to take my grandkids to the public park and pray there aren’t any gangster action at the same time. Duh! Maybe the girls could pick weeds at the White House and save some money on gardener’s salary? Why doesn’t Obama send the kids over to Kenya on vacation to see where he was born!!!!!! Since when do girls their age go on trips for spring break??? And without parents??? Of course when the oldest went to Mexico a couple of years ago she took (14?) friends and without parents! We paid for all their transportation, food, souvenirs I’m sure and whatever expenses were incurred. All of the presidents and their families have taken vacations. It is expensive, also please check on the cost to protect Barron and his Mom while they live in NY. I have read that it will cost over a million dollars a day.